If you plan to eat at Amalia’s, make sure it’s during regular mealtimes, and not between 2:00 pm and 6:00 pm…unless you’re prepared to sweet talk your way in for a bit of paella. B and I decided to have a late lunch, because getting up early isn’t exactly on our list of priorities on Sundays. Sunday, I believe, is made for napping, vegging in front of the TV, and eating out…all done after 12:00 noon. So it was a bit of a letdown when, after traveling all the way from QC, we found a “Closed” sign hanging on the glass door. One group was at the tail-end of their meal, and as they exited, I popped my head through the door and asked one waitress, “Pwede?” This despite the sign posted on the door, proclaiming their operating hours. She looked back at the counter where some of her co-workers were. “Nanggaling pa kasi kaming QC eh…” I said. Hey, it was worth a shot. She and the others finally agreed, and I quickly got the rest of me through the door before they changed their minds. B followed, and we settled into a booth lined with pretty cream-colored damask, and with a mosaic pendant lamp hanging overhead. No visit to a Spanish resto is complete without an order of paella, and since Franco beat me to the Paella Espanola, I got the Paella Marinara (P235 for one, P440 for three). 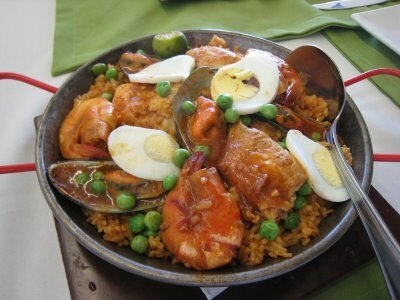 If the name doesn’t help, this paella is loaded with seafood: fish fillets, mussels, shrimp, and some eggs, green peas, and red pimientos for good measure. 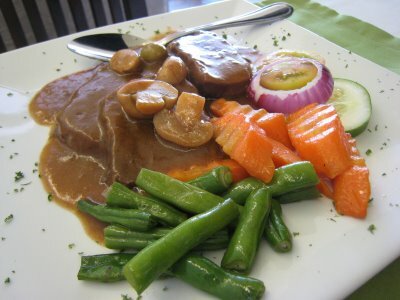 We also ordered the Lengua con Setas (P275). I had this in my head as I sliced my lengua, trying to quell the image of dancing taste buds. I really do like the taste of lengua, but sometimes the texture is just too much like…tongue! Almost jelly-like. Not a pleasant texture for someone with a hyperactive imagination. I had a pleasant meal, and I couldn’t complain about the food. And I am really thankful to the staff for letting us dine there during what was supposed to be their afternoon break. Would I go back? Probably. Just not any time soon–there are other restaurants to try. The best paella's I've had were made by folks at their homes, so that doesn't help, but if you ever make it up to Claude Tayag's Pampanga home/restaurant, we were served a really good paella there. And lots of tutong/socarrat at the end of it all! We're on the same strip and side as Amalia's. After the Elizalde intersection. Check out our fan page on facebook to find out more about Twenty One Plates.